Novaspan is the best value, most versatile heavy duty shelving system. It’s quick and easy to assemble, and it’s a good-looking system. 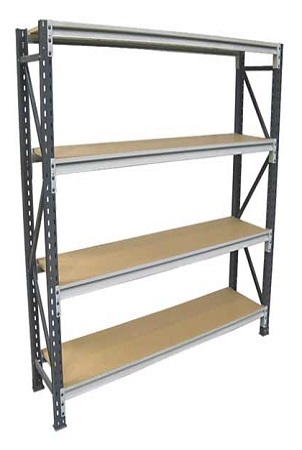 This is a high-quality, low-cost, long-span shelving system, designed for warehouse storage where wide and deep shelving is required. Fully adjustable shelf levels in 50mm increments. Modular design, can be added to or reconfigured at any time. Easy and quick to assemble or adjust. Full epoxy powder coat finish. Standard colour dark grey frames with light grey beams. Shelf capacity upto 700kg (60mm thick), 1000kg (80mm thick) per shelf level depending on beam length and thickness. When calculating requirements, add 60mm to length for every end frame.